Beeswax amber is a traditional faux resin amber often used when making Tibetan jewelry, especial since tree amber is in scarce supply in the Himalayas. It is sometimes called "beeswax" amber because it is similar in color to honey. This exceptional contemporary bracelet was handcrafted in Nepal using antique Tibetan tribal-jewelry styling. It was skillfully and sturdily made; it does not bend. 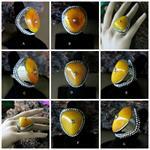 Selection on large contemporary Tibetan tribal jewelry rings handcrafted in Nepal of beeswax amber. Price is for one ring. Classic Tibetan Style Necklace of Faux Amber with Turquoise and Dzi agate accent beads. The classic Tibetan Contemporary Ethnic Necklace was handmade using Turquoise, Faux Amber, and Brass.